Funny how certain episodes of Shooting Gallery, Best Defense or Cowboys trigger unexpected reactions. We are for the most part prepared for viewer reactions and questions in terms of product info and product applications. We also do our best to link up products used in each episode here on DRTV as a service to our loyal viewers. While we got some expected heat by some about the Shooting Gallery zombie episode, we didn’t expect to spend the major part of Thursday morning answering emails and phone calls about the Rossi Ranch Hand, the lever action pistol Michael used in his hunt for Zombies. As one caller expressed it: “I didn’t care much for the episode, but that short lever action made me watch through the entire ordeal. So where can I get one?” Other people just loved the episode, some have already seen it twice just to get some more details on the firearms used. In a timely fashion, Rossi USA sent out a press release earlier this week “introducing the Rossi Ranch Hand“. It was actually introduced last year and my good friend Jeff Quinn put it to test back in December. Another clone of Steve McQueen’s Mare’s Leg was introduced by Legacy Arms in early 2009 and called Puma Bounty Hunter. The Rossi Ranch Hand seems to be the most popular mostly caused by a price tag around half the price of the Puma version. You should be able to get your paws on a Ranch Hand for under 500 bucks. As I write this, Gunbroker has this pistol listed with a starting bid of $450.00. To repeat my standard answer to another question of this morning: “Can you give me an example of an application for this firearms?” My answer is this: Zombies? Seriously, I can’t. But if you simply just want to buy a Ranch Hand, it’s reason good enough and it will give you a fun day at the shooting range. Heck, 80 percent of my firearms are bought for that purpose. To top it off, why not add some leather to your shopping list. Mernickle manufactures leather for this Mare’s Leg clone and is sold exclusively through Legacy. Thanks. I owned an older Rossi lever riflke in .357 magnum, and really loved shooting it. 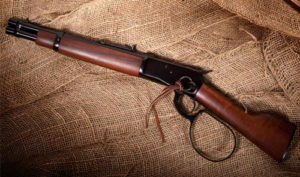 It never failed, with magnums or .38 Specials, and it wass a very handy size and weight, even with the 18″ barrel and full stock. Rossi makes a fine quality product-My regular carry is a Rossi 462 .357 magnum snub, and that has never failed, either. Got me one of these in .45 Colt. Can’t wait to shoot it. It’s very solid and well made. Not sure if I want the holster for it or not. That holster costs as much as the gun does. Ive got one. Its sweet and a play pretty but not my carry weapon. It’s fun and accurate with low kick and you can shoot 38s cheaper for practice but it will blow a good hole in something with your 357 hollow points!